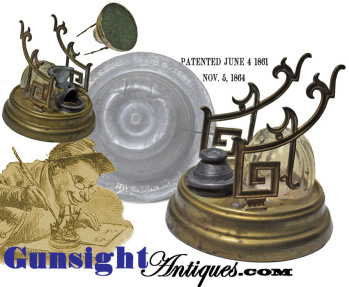 A nice all original Patent June 4, 1861 / Nov. 5, 1864 desk pen stand and inkwell. The spun brass base measures approximately 5 inches in diameter and is fitted with a pen stand of cast iron. A glass ink reservoir is set in with a patent dated hinged pewter top. All in nice original condition with natural age, uncleaned and with evidence of period use while remaining in nice original condition. A neat piece for the Civil War personal item and antique writing instrument collector. Buy with confidence! We are pleased to offer a no questions asked three day inspection with return as purchased on direct sales! Just send us a courtesy e-mail to let us know your item will be returned per these provisions and your purchase price will be refunded accordingly. Thanks for visiting Gunsight Antiques !